Wow, we do a lot with our phones these days, I often have so much going on all at once It can be a bit frustrating, the phone can only do so much… I’m not sure a smartphone is really as SMART, as it sounds, The smartphone experience is complicated by tons of different apps and accounts that folks like us need to try and keep up with — from making calls, texts, emails and instant messages and then, status updates, Tweets, check-ins, photo posting and tagging. Its all too much, isn’t it? Well Microsoft Corp. today previewed the next major release of Windows Phone, code-named “Mango,” Mango will deliver more than 500 new features that will actually integrate the entire smartphone experience including all your communications, apps and the Internet. The new “Mango” release organizes information around the person or the group that we want to interact with, not the app we have to use. More on specific features after the break. Mango allows its users to switch between text, Facebook chat and Windows Live Messenger all within the same conversation. It will group contacts into personalized Live Tiles to see the latest status updates right from the Start Screen and quickly send a text, email or IM to the whole group. Your Twitter and LinkedIn feeds are now integrated into contact cards, and Mango includes built-in Facebook check-ins and new face detection software that makes it easier to quickly tag photos and post to the Web and hands-free messaging with built-in voice-to-text and text-to-voice support that enables hands-free texting or chatting. Mango is also a Multitasker. Mango allows you to quickly switch between apps in use and allow apps to run in the background, helping to preserve battery life and performance. In addition to including Internet Explorer, the Mango release will connect the power of the Web to the unique capabilities of Windows Phones, such as location awareness, camera and access to apps, to present a way of viewing the Web that is more localized, actionable and relevant. They really aren’t going to produce a phone that only makes calls ever again, are they? 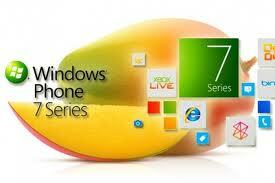 The “Mango” release will be available for free to Windows Phone 7 customers and is scheduled to ship with new phones beginning this fall.